Today, I am going to discuss about the installation of CUDA 6.5 Toolkit & Drivers on Fedora 20. From last few days a number of query regarding this problems are being asked. And Yes, Installation of CUDA Toolkit on Fedora 20 (Heisenbug) release is really a tough and challenging task. There are number of problems encountered during the installation of CUDA Toolkit. Following are the basic components necessary to install CUDA SDK on Fedora 20. NVIDIA CUDA Enabled GPU Card. Make sure that you have a CUDA enabled NVIDIA GPU Card already installed in your machine by checking first link. Second link will tell you about the drivers required for your GPU Card.Third link tells you about the latest CUDA Toolkit available in the market. Fourth link guides you with some code samples in different application areas. 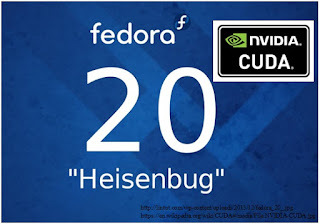 As, Fedora 20 Heisenbug release is not as stable as its previous versions, one may face the problems during the installation of CUDA such as Display Drivers of Fedora 20 may not support GPU card Drivers, Flickering of Display while you use it,etc. Follow these steps to get rid of all problems and ease the installation experience. 2) Verify the system has a CUDA-capable GPU. 3) Verify the system is running a supported version of Linux. 4) Verify the system has gcc installed. 7) Install dependencies of akmods by following command (Prerequisite for CUDA). This is Display driver requirement. In many cases, one may face lot of problems due to not following this step. You need to select your Operating system and corresponding RPM & RUN file. 11) Reboot system and you can start coding from Nsight eclipse edition. I hope after following these steps you will be able to complete installation of CUDA 6.5 on Fedora 20 without any errors. Please do comment in the comment box below if you face any problems. I will be glad to help you. These installation steps worked for me. Nicely explained author. Good efforts for writing post. Keep these efforts.